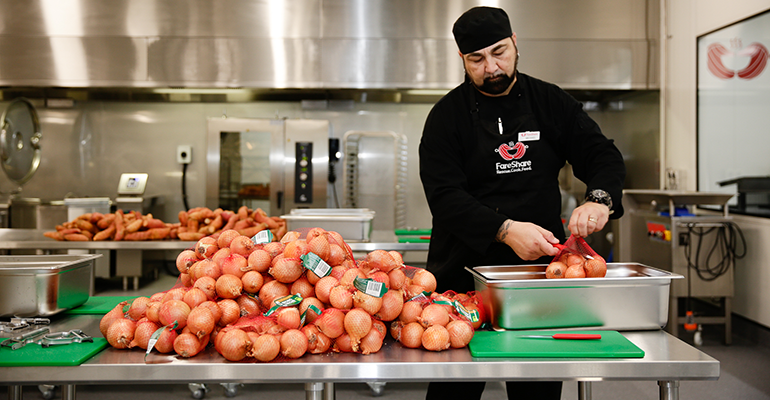 Foodbank and FareShare are teaming up to open Australia’s largest charity kitchen, and will cook up to five million meals a year for people struggling to put food on the table. The $4.5 million basketball court-sized kitchen was opened on Tuesday by Queensland Premier Annastacia Palaszczuk, who said truckloads of good food would be saved from going bad and tossed into landfill. “It will be turned into nutritious, delicious meals instead – chilled, distributed, reheated and served,” Palaszczuk said. Foodbank will initially harness 500 tonnes of surplus meat and vegetables to supply the kitchen and experienced chefs will supervise FareShare volunteers to cook a daily mystery box of ingredients into ready-to-eat meals like casseroles, curries and stir fries. FareShare’s Queensland director Kellie Watson said the charity aimed to cook more than one million meals in its first year and scale this up to five million meals a year. All meals from the Brisbane kitchen will be designed to be easily reheated with no need for full cooking facilities, making them ideal for vulnerable people struggling to eat. Foodbank will distribute the cooked meals to Queenslanders in need through its existing network of 280 registered charities. Foodbank Queensland CEO Michael Rose said last year alone, the charity received more than five million kilograms of fresh fruit and vegetables, mostly direct from Queensland farmers. “The top five farm donors from Bundaberg donated a staggering 1.5 million kilograms and stand ready to donate even more once the kitchen comes on line,” Rose said.